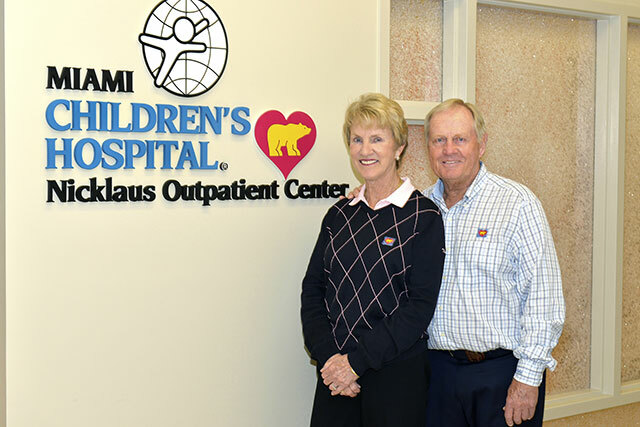 Miami and North Palm Beach, Florida — The Miami Children’s Health Foundation announced today that Jack and Barbara Nicklaus, widely recognized as the most renowned, revered and philanthropic family in the game of golf, will serve as the Chairs of the Together For The Children Campaign. Jack and Barbara Nicklaus will lead the fundraising efforts for the Together For The Children Campaign, which has a goal to fundraise $150 million dollars through 2017. Jack and Barbara will join the Miami Children’s Health Foundation in the official campaign kick-off event in March at the Miami Children’s Hospital’s 65th anniversary celebration. This news comes on the heels of the recent announcement of a $60 million dollar pledge from the Nicklaus Children’s Health Care Foundation to Miami Children’s Health System to support the sustained growth and advancement of the health system’s acclaimed Miami-based children’s hospital. In recognition, Miami Children’s Hospital—the flagship of Miami Children’s Health System—and its network of eight outpatient centers will bear the Nicklaus Children’s Hospital name, effective in March of this year. Jack is considered golf’s greatest champion and a sports icon who has been recognized with countless honors, including the Presidential Medal of Freedom and now the 2015 Congressional Gold Medal. Barbara has been decorated with numerous honors, including the PGA of America’s First Lady of Golf, the PGA TOUR’s Ambassador of Golf Award, and in 2015, will be recognized with the USGA’s highest honor, the Bob Jones Award. Together, the Nicklauses have been passionate and tireless philanthropists, with a particular focus on pediatric healthcare. Because of this mission, they have partnered with Miami Children’s the past five years to bring world-class healthcare to the children of Palm Beach County through the MCH Nicklaus Outpatient Center and have provided significant philanthropic support from the Nicklaus Children’s Health Care Foundation. This recent transformational commitment is a result of their confidence and trust in the leadership and vision of Miami Children’s Health System. The pledge and their support will make possible many enhancements for the hospital, including supporting construction of the planned 212,000-square-foot Advanced Pediatric Care Pavilion, now in progress. This new facility will include provisions for three new family-centered intensive care units. Funds will also support emergency and trauma preparedness, and enhance globally recognized centers for excellence at the hospital, including the Heart Program, Cancer Center and Miami Children’s Brain Institute. To learn more and help support Together for the Children, please visit www.mchf.org/donate or call Miami Children’s Health Foundation at 305-666-2889 (toll free: 1-800-987-8701). Miami Children’s Health Foundation (MCH Foundation) is a not-for-profit 501(c)(3) established to create a world-class pediatric hospital so no child needs to leave South Florida for superior medical care. “Funding World-Class Care” and following the principle that all children deserve state-of-the-art pediatric care with no financial boundaries, MCH Foundation, now a part of the newly formed Miami Children’s Health System, has helped the 289-bed Miami Children’s Hospital become a leader in pediatric healthcare with more than 40 subspecialties, the largest pediatric neurology center in the United States, a top provider of cardiology and neonatology services, and a Research Institute conducting in excess of 200 clinical trials and protocols. Currently, MCH Foundation is dedicating all its resources to Together For The Children, The Campaign For Miami Children’s Hospital, which aims to raise $150 million by 2017 and will help fund MCH priorities, including the expansion and enhancement of the Emergency Department, as well as the construction of a new Advanced Pediatric Care Pavilion, and expanding its Global/Telehealth endeavors. Founded in 1950 by Variety Clubs International, Miami Children’s Hospital, soon to be renamed Nicklaus Children’s Hospital®, is South Florida’s only licensed specialty hospital exclusively for children, with more than 650 attending physicians and over 130 pediatric subspecialists. The 289-bed hospital is renowned for excellence in all aspects of pediatric medicine with several specialty programs ranked among the best in the nation in 2008, 2009, 2010, 2011, 2012, 2013 and 2014-15 by U.S. News & World Report. The hospital is also home to the largest pediatric teaching program in the southeastern United States and has been designated an American Nurses Credentialing Center (ANCC) Magnet facility, the nursing profession’s most prestigious institutional honor. For more information, visit http://www.mch.com. Founded in 1950 by Variety Clubs International, Miami Children’s Hospital—soon to be renamed Nicklaus Children’s Hospital—operates South Florida’s only licensed specialty hospital exclusively for children, with more than 650 attending physicians and over 130 pediatric subspecialists. The 289-bed nonprofit hospital is renowned for excellence in all aspects of pediatric medicine and routinely has many programs ranked among the nation’s best by U.S. News & World Report. The organization has grown and evolved into the Miami Children’s Health System (MCHS), which includes Miami Children’s Health Foundation, the organization’s 501(c)(3) fundraising arm; a network of eight nonprofit outpatient centers situated in Miami-Dade, Broward and Palm Beach counties; Pediatric Specialty Group, Inc., a nonprofit physician practice subsidiary; a management services organization, and an ambulatory surgery center (opening soon), as well as an e-commerce line of children’s wellness and safety products that supports the hospital’s mission of serving the region’s pediatric population. MCHS is the region’s only healthcare system exclusively for children.